The Harmony 5 is the smallest stove in the Harmony range. 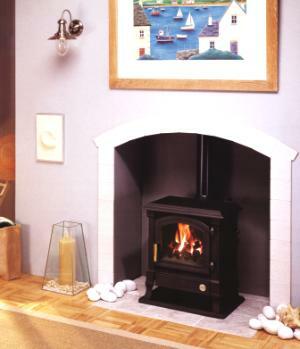 and modestly brings the permenance of cast iron and the elegance of the larger stoves into smaller rooms. With its heat outputs ranging from one to five kilowatts, this little stove is capable of providing gentle background heating or transforming the coldest or most inhospitable of rooms with temperatures of tropical splendour at the turn of a knob. It has electric push button ignition making lighting almost effortless, and should the power fail the stove can be lit manually and will run without any electrical supply. Supplied with both top and rear flue fittings, the Harmony 5 is available in cast black, green enamel and brown enamel or as illustrated here, in satin black enamel. The stoves have a cast iron plinth in a matching finish which refines the stove's appearance to a picture of understated sophistication.